We’re a diverse group of down-to-earth, straightforward people with a passion for home furnishing. We come from all over the world, but we share an inspiring vision: “to create a better everyday life for the many people”. How we realize this vision is based on our shared humanistic values. These values guide our work and build our inclusive, open and honest culture. It’s all based on a spirit of togetherness and enthusiasm. We work hard, but we have fun doing it. We’re always looking for people who share our positive attitude and values. Ingka Group is the world’s largest home furnishing retailer, with three business areas: IKEA Retail, Ingka Investments and Ingka Centres. Working at the Ingka Group means that you are part of an inspiring, fun, and fast-paced environment. We value a diverse and inclusive workplace, and encourage everyone to be who they are. The One IKEA Bonus program is a bonus system for all IKEA Group co-workers, based on performance. It is based on our values of simplicity and togetherness, with everyone in the same unit working towards the same objectives. Sharing goals helps us to work together as one IKEA. Tack! is our way of showing appreciation to our co-workers for their loyalty to IKEA and their contribution to our continued success. Through Tack! (which means ‘thank you’ in Swedish), co-workers receive an additional contribution to their pension funds. All eligible full-time co-workers within a country receive the same amount, regardless of their unit, position or salary. We invest in our co-workers’ development by offering a variety of internal training programs – for those who want to learn something new and grow. Every IKEA co-worker also gets the opportunity to create a development plan. Together with your manager, you set goals for the coming year and the future. Caring for People and Diversity & Inclusion is embedded in our vision and in our values. At Ingka Group, we see diversity and inclusion as the right thing to do. Recognizing our co-workers’ differences contributes to creativity and supports our growth. We strive to have a diverse and inclusive work environment where co-workers feel valued for their uniqueness, recognized for their diverse talents, and where they can be themselves. Today 49.4% of our leaders are women, and the goal is to reach gender balance in all levels of leadership, functions, and positions. When we have the same opportunities to grow, regardless of gender or background, everyone wins. Balance for better. At Ingka Group, we welcome all dimensions of diversity. A diverse and inclusive workplace is good for our co-workers, for our customers and for our business. Working with differences helps us grow both as individuals and as an organization. Gender equality is a human right. Our ambition is to reach gender equality at IKEA Group which goes beyond a 50/50% gender balance in all levels and positions. Gender equality is also about creating an inclusive culture where all genders are valued for their unique contributions. That is why we... have been working with the gender agenda for over a decade. We are proud to have been part of the first UN high-level panel on Women Economic Empowerment, to help unlock potential for women to fully participate in the economy and achieve financial independence. That is why we... have joined Workplace Pride Foundation and Stonewall, two organizations focused on LGBT+ inclusion in the workplace. That is also why we have endorsed and contributed to the UN Standards of Conduct for Business on Tackling Discrimination against LGBT+ people that was launched globally September 2017. Inclusion at Ingka Group is about creating a work environment in which our co-workers are successful because they feel welcomed, respected, supported and appreciated. It is about developing an infrastructure with collaborative ways of working; it is about practicing inclusive behaviors daily and making the most of our differences. I joined IKEA in 2004 and have worked in different roles in Human Resources. In January 2016 I began my current job as Distribution Center manager. Particularly in China I feel proud of the gender balance when it comes to equal treatment and percentage of women and men in the organisation. In fact, in 2017 we have reached gender balance (50/50) in all levels of leadership, as well as equal pay for jobs of equal value. I am happy to be part of the D&I Network. We all together aim to create a diverse and inclusive work environment, having a positive impact on our business and society. I usually think that a dream you dream alone, is just a dream; while a dream you dream together is the beginning of a new reality. We work to minimize the environmental impact of our operations and to help people live a more sustainable life at home. We work in roles inside and outside our stores, from the reception to the check outs, exchange & returns and contact centers. We want to have a positive impact on people and the planet. We want to play our part in creating a better life for the people and the communities touched by our business. 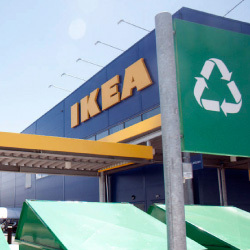 Discover what sustainability means to us at IKEA and our efforts. If you would like to find out more about what we do before you apply for a position, you can learn all about us here.